All shades of yellow are combined to produce our Yellow Polished Cobbles. The smooth, rounded shiny surface makes them a great choice for many projects including grave dressing, landscape, interiors, dressing fish ponds, fish tanks and any other water feature. Available in 3 sizes, small, medium & large – see photo for illustration. 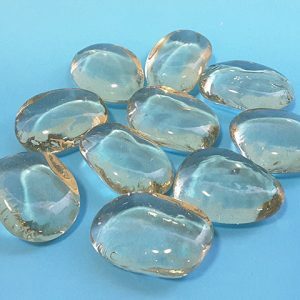 Our Yellow Polished Cobbles are a beautiful shiny river cobble. 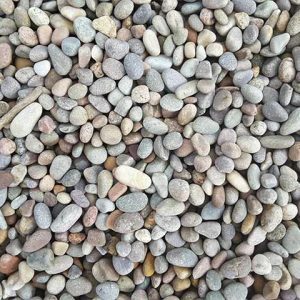 These smooth, rounded cobbles are available in three sizes, 10-30mm, 30-50mm and 50-80mm. Yellow polished cobbles are a natural cobble. The smooth, rounded surface is achieved using a unique production process. Once collected, the cobbles are tumbled over and over again in a cylindrical drum to achieve the rounded edge. This process can take between 6 and 8 days. A wax is then applied to the product a number of times to achieve the shiny effect. Heat is also applied during the waxing process to ensure the gloss effect lasts as long as possible. However please note that the cobble, if exposed to the elements will, over time, become more matt in appearance. 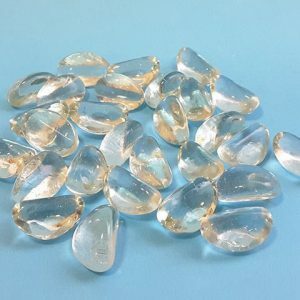 Yellow Polished Cobbles have many uses – one of which would be grave decoration. The cobbles compliment darker coloured granite headstones and surrounds. The yellow is often used to compliment the gold lettering on the headstone. Such cobbles have also been used in internal and external landscape design. Internally customers have used them as ‘pot toppers’, in other words, to add to the top of the potted plant to disguise the clay and give a clean appealing look. Externally the cobbles have been used in many landscape projects. 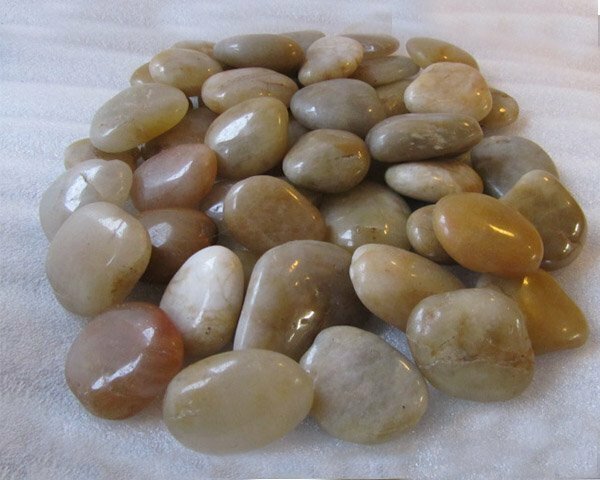 Some will use the yellow polished cobbles as a garden pebble, whilst others have used them as part of a water feature. 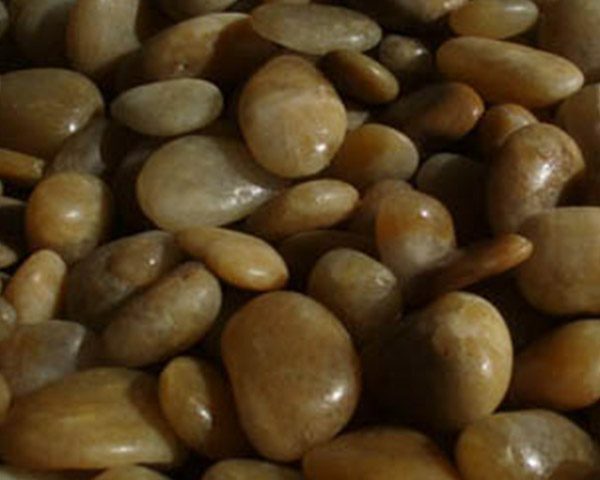 Our smaller sized yellow polished cobbles have been used in internal fish tanks or as part of larger external fish ponds. They are perfectly safe to use in the pond. 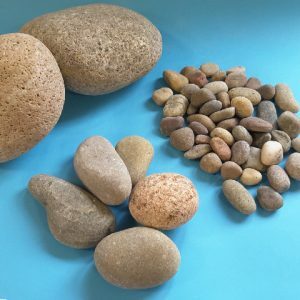 They are a natural stone and with the smooth rounded edges, they will not cause any harm to the fish. .
Yellow polished cobbles can also be used for decorative purposes in concrete footpaths, driveways, patios and paved areas. Recently a customer used the cobbles to edged a concrete drive. They set the cobbles in concrete to distinguish one paved area from another. The cobbles can give any concrete project a nice decorative finish. 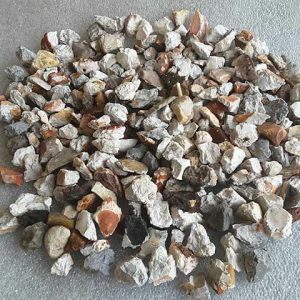 Many florists have incorporated our range of polished cobbles in floral arrangements for weddings, table decor and internal planting. 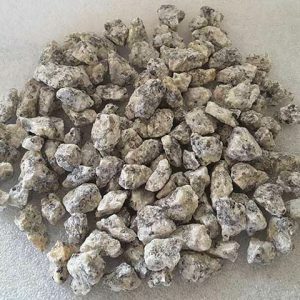 Many favour the smooth, shiny nature of the cobble thus making it a unique product for any table display or internal planting. Some have added the cobbles to the base of a flower vase, others have used the cobbles to dress the top of the pot. 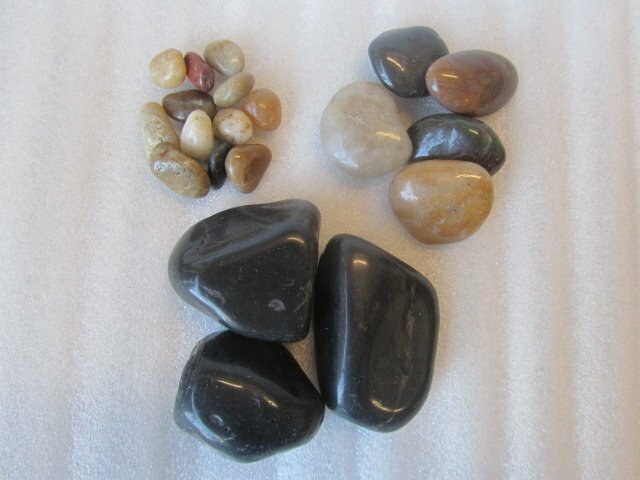 They are a natural product and therefore sit beautifully with any arrangement. The cobbles have also been used for various arts and crafts projects. 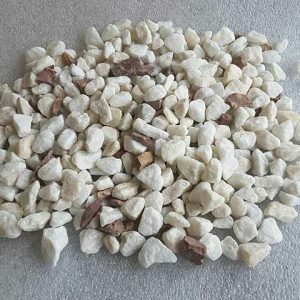 Customers have used the cobbles on their own or with a selection from our range for mosaic projects and other handcrafted pieces.